If you or someone close to you suffers with a lung disease, such as chronic obstructive pulmonary disease (COPD), pulmonary fibrosis, asthma, chronic bronchitis and lung cancer, there is hope for enjoying a fuller and more active life through pulmonary rehabilitation. These programs help improve lung function and reduce severity of symptoms, which can include shortness of breath, wheezing and chronic cough. This year, March 10-16 is designated as Pulmonary Rehabilitation Week to spotlight treatment options available that improve the quality of life for those with lung disease. A pulmonary rehab team often includes doctors, nurses, physical therapists, respiratory therapists, exercise specialists and dietitians. Together, they create a personal program to meet the specific needs of patients. Pulmonary rehab includes helping patients who are preparing for lung transplant or lung volume reduction surgeries. It also includes clinics and support group meetings for smoking cessation. By far, smoking is the No. 1 risk factor for lung disease or lung cancer. Baptist Health South Florida offers cessation programs to smokers who are ready to quite the habit. Follow-up counseling, which is crucial for many patients, is available to address the “relapse” rate among former smokers, says Mikki Thompson, director of pulmonary services and Lung Health Program at South Miami Hospital. Pulmonary rehabilitation is usually recommended for patients with lung disease who frequently suffer from shortness of breath — to the point that it interrupts daily activities despite the regular use of medication. Clinical studies show that pulmonary rehab helps reduce hospitalizations and ER visits. “Anyone with symptomatic COPD should attend pulmonary rehabilitation and patients with asymptomatic COPD should attend a maintenance program,” said Rodney G. Benjamin, M.D., a pulmonologist with the Lung Health Program at South Miami Hospital. “The program teaches you about your disease and how to exercise, strengthen your breathing muscles and be more active with less shortness of breath. These programs will enhance your quality of life. 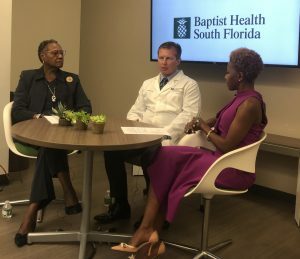 Watch Baptist Health South Florida’s Facebook Live episode on Smoking, Vaping and Lung Cancer. Hear from Mark Dylewski, M.D., chief of general thoracic surgery at Miami Cancer Institute, and Mikki Thompson, director of pulmonary services and Lung Health Program at South Miami Hospital on misconceptions about smoking-vaping, e-cigarette addictions in adolescents and how to reduce your chances of developing lung cancer.